What do people say about you when you leave the room? You can influence the conversation! Are you confident? Can you easily articulate your ideas? What about your body language? What kind of message are you sending by the way you hold yourself – whether you’re leading a meeting, at a networking event, or joining a discussion around the table? I want you to communicate your best self. Don’t be left at the mercy of what people say! Know your brand – your strengths and values – so you can pro-actively communicate the BEST parts about yourself. You can also develop an executive presence, so you can be influential and persuasive. We do this through body language, voice, tone, and gestures. What is it YOU want to be known for? What kind of impression do you make on others? 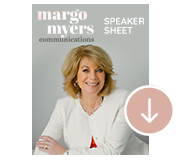 Learn how to pro-actively communicate their strengths and val­ues with every move they make. Get inspired to build ‘brand equity’ to propel their path up the career ladder, starting today. Communicating a confident executive presence can be crucial to your career success. Studies have shown “executive presence” counts for 26% of what it takes to get promoted. Other studies show that only 45% of women believe ‘executive presence’ is important to promotion. How to “command the room” with one simple move you already know how to do. Breakthroughs in neuroscience on how to “read” what other people truly mean. I customize my talks to your group, so you get real-life scenarios that pertain to you and your business. I also address leadership communication, managing your emotions, and high-stakes workplace conversations.